Watching your child learning to read is a joy. Picking up all the scattered children's books afterwards – not so much. So keep your kids' bedrooms tidy by taking advantage of our smart children's book storage solutions. Sometimes the simplest solution is the best one, and nothing beats a cube storage unit for keeping children's books tidy, plus cubes are stackable so you can add to them as your child's needs grow. We like the Handbridge Storage Cube from A Place for Everything. The handy divider on the top shelf makes keeping books tidy even easier, while the bottom drawer is great for toy storage and crayons. For a storage solution that allows your child to keep their favourite bedtime reads right where they need them, look for a book sling. Hang it on hooks on the wall next to your child's bed and they'll never have an excuse to get up and down to go to the book shelves again. 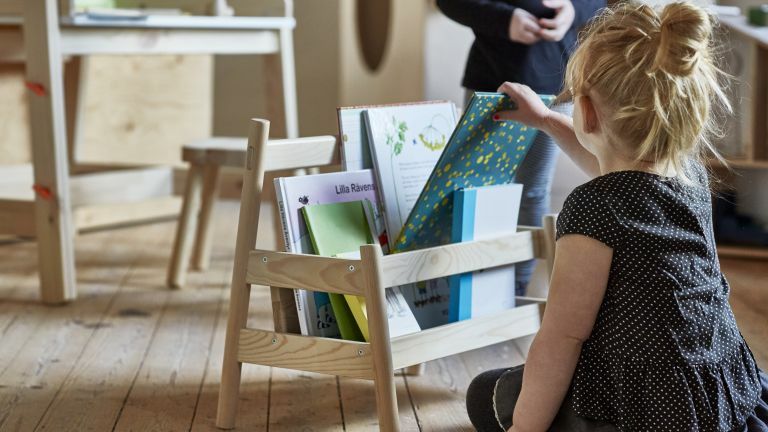 We like the jolly Stripe Book Sling Storage from Little Pea Studio, which comes with solid oak dowels. Available at Not On The High Street. Learning to tell the time can be tricky for some children, and they will benefit from a handy reminder or two. Combining reading with practising telling the time is a great way to make the most of your child's attention. We like the very cute Tidy Books Tidy Box from John Lewis, which comes with a play clock on the side. If you want your child to learn to access their books without your help, choose a storage unit that is low so that they can reach the books they want (and hopefully put them back, too). We like the convenient and simply designed Flisat book display from Ikea. If you're looking for decorating ideas for a child's bedroom, a colourful, fun bookcase is a great way to introduce colourful storage into kids' bedrooms. We can't stop admiring the charming Walter Kids' Crocodile Bookcase. Children's books do not necessarily have to be stored on their own; storing special books alongside a jar of crayons and picture frames, as in this example from Little Folks Furniture, is a good way to keep them safe. For similar items, see Etsy and Not On The High Street. If your living space is open plan, positioning a large bookcase strategically can allow you to create a devoted reading corner for your kids. Here, Elms Interior Design have used a bespoke bookcase as a room divider to create a kids' zone in an open plan room. Storing all books in the same storage box or bookshelf can make it difficult for your child to find their favourite book quickly. Choose a low storage unit with lots of dividers, so that each book can be stored in its own compartment. We like the well crafted and cute Baa Baa Book Shelf from Rowen & Wren, available at Not On The High Street. Bedtime reading is one of the great joys of childhood (and parenthood! ), but finding their favourite bedtime read quickly can be a challenge . . . not with a hook-on shelf, where their favourite books will always be to hand. We recommend the Fargo Hook-On Hanging Shelf from Little Folks Furniture. We love sling bookcases as children's book storage; they hold everything together, but are easy enough for a child to access the books whenever they want. They also make a colourful addition to kids' bedrooms. Our pick of the bunch is The KidKraft Sling Bookshelf from Wayfair. Its shelves are made from soft canvas – perfect both for books and for delicate little hands!